What is bww file? How to open bww files? The bww file extension is associated with Bagpipe Music Writer, a program for Windows with which users can easily create Bagpipe music. The bww file contains saved music notation in Bagpipe Music. 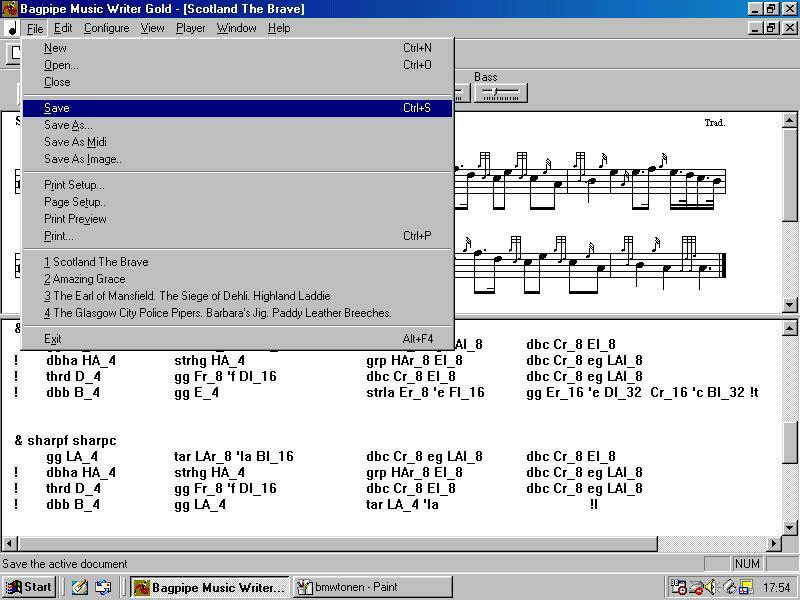 Bagpipe Music Writer GOLD provides low cost desktop publishing software for bagpipe music on IBM PC compatible computers. Use Bagpipe Music Writer or MuseScore to open the *.bww notation file. Use MuseScore to save BWW Bagpipe Music Writer notation file to other music notation format. and possible program actions that can be done with the file: like open bww file, edit bww file, convert bww file, view bww file, play bww file etc. (if exist software for corresponding action in File-Extensions.org's database). Click on the tab below to simply browse between the application actions, to quickly get a list of recommended software, which is able to perform the specified software action, such as opening, editing or converting bww files. Programs supporting the exension bww on the main platforms Windows, Mac, Linux or mobile. Click on the link to get more information about listed programs for open bww file action. Programs supporting the exension bww on the main platforms Windows, Mac, Linux or mobile. Click on the link to get more information about Bagpipe Music Writer GOLD for edit bww file action. Programs supporting the exension bww on the main platforms Windows, Mac, Linux or mobile. Click on the link to get more information about Bagpipe Player Software for play bww file action. Programs supporting the exension bww on the main platforms Windows, Mac, Linux or mobile. Click on the link to get more information about MuseScore for convert bww file action. Programs supporting the exension bww on the main platforms Windows, Mac, Linux or mobile. Click on the link to get more information about Bagpipe Music Writer GOLD for create bww file action. Programs supporting the exension bww on the main platforms Windows, Mac, Linux or mobile. Click on the link to get more information about bwwtolily for import bww file action.